RUTS DC will headline the first ever Westworld Calling show, which takes place in London on Saturday, September 2, 2017, at O2 Islington Academy. 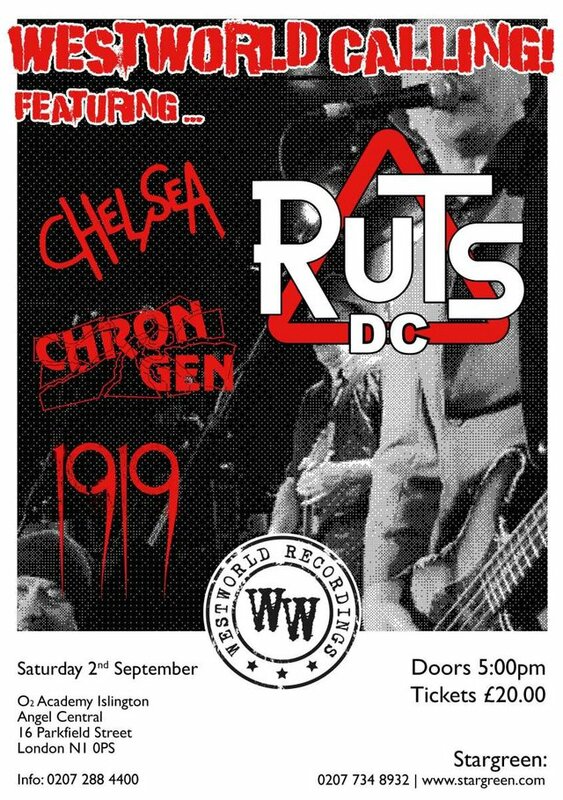 Joining them on a stellar bill are Chelsea, Chron Gen and 1919, all Westworld Recordings label mates. With their roots undoubtedly deeply set in the initial mid-to-late seventies punk explosion, The Ruts, and then RUTS DC, very quickly developed into a musical hybrid that took in so much more than the basic three-chord-1234 that dominated much of what was labelled as punk. Already accomplished musicians, they effortlessly weaved reggae, ska, dub, rock and post-punk influences into a musical catalogue that is as inspiring and powerful now as it was when it was created. The tragic death of their original frontman Malcolm Owen in 1980, and then their guitarist Paul Fox in 2007 is well documented. Last year saw Ruts DC - John ‘Segs’ Jennings (bass and vocals), Dave Ruffy (drums), Leigh Heggarty (guitar) release their first full album of rock music since ‘Animal Now’ album in 1980. ‘Music Must Destroy’ released last September was definitely worth the wait, garnering praise from all corners of the world including album of the year in Vive Le Rock magazine. Punk legends CHELSEA were there at the start and are still going strong today. Formed in August of that year by mainstay Gene October with former members William Broad (Billy Idol), Tony James and John Towe they made their debut on October 18, 1976, at London’s ICA. After line-up changes (when the aforementioned jumped ship to form Generation X) they released the first in a string of classic punk anthems starting with “Right To Work” early in 1977 on Step Forward Records and have consistently delivered through a forty year career, most of which is now available on three massive Anthology box sets released last year on Westworld Recordings. Currently recording the follow-up to their latest new studio album 'Saturday Night Sunday Morning' from 2015 Chelsea will be busy throughout the foreseeable future. CHRON GEN were never typical of the bands they shared stages with in the early 80’s – their sound was always different – more melodic, powerful and considered, although it would be fair to say that the promise for much more was never realised; expectations never met . . . . . until now. Their latest album, “This is the Age” is well titled – It is Chron Gen’s coming of age. The contemporary production combines a diverse collection of thought provoking lyrics and classic song structures to create an audio experience that matches the energy of their live performances. This album isn’t reserved for the punk old guard. Far from it – it is 21st-century rock that will appeal to music fans of all generations and genres. It is fresh, different and exciting. Every song deserves its place on the album, although there are many stand out numbers, such as Maybe Baby, Jump and Love this City. 1919 formed in December 1980 in Bradford and set about recording heavy, melodic, intense dance music with no frills and pretentions. The band were an early contributor to what became the Goth genre.” (Gods and Alchoves) 1919 had chart success with the singles “Caged”, “Repulsion” and “Cry Wolf” as well as the 1984 LP “Machine”, and recorded two Peel Sessions. Earlier this year released their second full-length album ‘Bloodline’ on Westworld. WESTWORLD RECORDINGS has been building up quite a roster over the past couple of years. Frontline signings with new albums released includes the four bands mentioned above along with Peter Hook And The Light, Gene Loves Jezebel, Anti Pasti and Department S.
As well as classic re-issues from a virtual who’s who of the seventies and eighties street outfits like Discharge, Exploited, Toy Dolls, Anti-Nowhere League, Vice Squad, GBH, Extreme Noise Terror, Green Day, Angelic Upstarts, UK Subs, Bad Brains, Poison Idea, DOA, The Damned, Stiff Little Fingers, 999, Spear Of Destiny and The Fall to name a few.